I’m not much for celebrating anniversaries, but this is a particularly special one. It’s my “Pottyversary!” A year since I changed a poopy diaper! A year since we got our first pee in the potty! And now I don’t have to wash diapers (cloth diaper mama here) AT ALL! It’s a great feeling. In honor of my “pottyversary” (ok, maybe it was just a coincidence) my daughter finally became fully self-sufficient at using the potty. Well, 99% self-sufficient. TMI but I still help wipe after poop. Truthfully, I’m sure we could have been at this point sooner. After a dramatic setback with autoflushers well-documented on my blog (we were getting close to self-sufficiency as early as August), I decided not to worry about a big toilet transition for quite a while. And, the little potty was just….. so easy. It was easy for my daughter to entertain herself on, and I didn’t have to help her onto it. I may have gotten a little lazy. One day, I had a bit of a wakeup call: when I picked my daughter up from preschool, they gleefully told me that she *only* uses the big toilet there now! I didn’t even know she had been using it at all! If you still have the small potty out (not in the bathroom) and your child can definitely make it to the bathroom instead of needing access to the potty at all times, move the potty to the bathroom! When I first did this, my daughter would still pick it up and bring it wherever she wanted in order to pee. Eventually I decided to set a limit on this. “The potty belongs in the bathroom. If you need to pee, you can do it in there.” Once this limit was set, the little potty suddenly became far less interesting. She couldn’t just take the potty out of the bathroom, plop it down in front of the piano or her puzzles, and hang out. Almost immediately, her interest shifted to the big toilet. I DO like the built-in seat reducer for the big toilet. This makes it a little bit more approachable to little bums. The potette can be used as a seat reducer on the big toilet in public bathrooms. “Let’s use the little potty ON the big one!” Once my daughter decided she wanted to do it all herself, she decided she didn’t need the seat reducer anymore. She actually tore it off the toilet, brought it out to us, and said, “I don’t need no seat reducer!” If you want more info on either of these products, visit my “Products” page. As with all things toddler, make it silly. The noises when going on the big toilet versus the small one are different. “Plop!” “Splash!” “Listen to THAT peepee!” These kinds of silly observations can make going on the big toilet more fun, exciting, and less intimidating. Offer choices. Simple choices that all get to the same goal work great for this age group. Do you want the seat reducer or just the big toilet? Do you want to use this bathroom or that? Me first or you? Praise self-sufficiency. It doesn’t hurt that my daughter got really interested in climbing things after starting preschool. 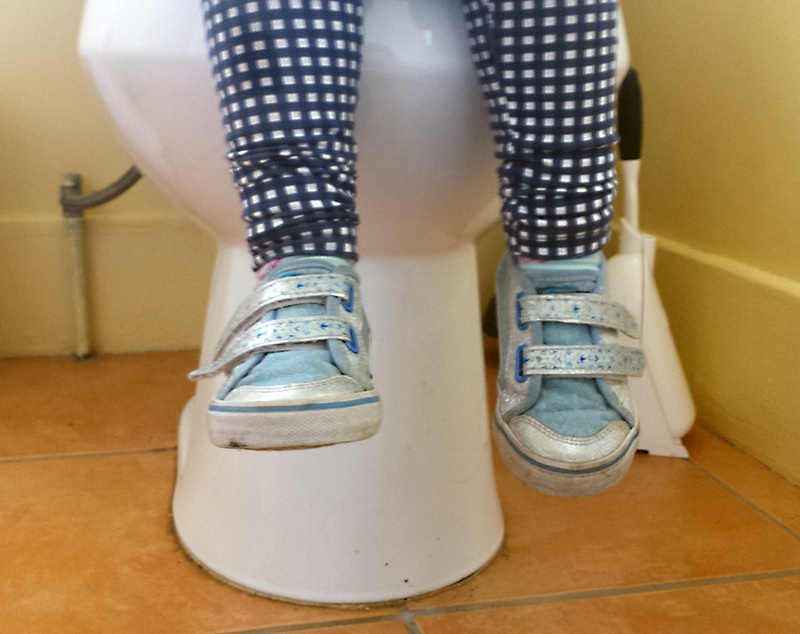 Kids get up on the big toilet in SO many different ways, and the way she got onto it was very different than I expected. She actually stood in front of it, turned around, got up on tiptoes, and pushed herself on backwards. It was so amazing the first time we saw it, we couldn’t help but be excited! It doesn’t hurt to treat this as its own milestone, and openly marvel at your child’s new skills. Once she had done this once, she wanted to practice it over and over – very quickly, she was a pro! And last, ALWAYS bring those post-its for autoflushers! Just yesterday we were in a public bathroom with a toilet that had a button flush. My daughter thought it was an autoflush sensor: YES – she actively looks for these each time we’re in a new bathroom – and she would NOT get on until I had covered that button up to reassure her. Just do it!! It’s a pretty cool feeling to no longer have to assist with this process. Have you made the big toilet transition yet? I’m in the middle of trying to potty train my daughter so all this insight is like a goldmine for me! Thank you!